The standalone streaming service is worth every penny. There are a lot of options for people looking to cut the cord these days, but live sports remains a big hurdle to getting rid of cable. Sure, the likes of Sling TV and others offer streaming access to sports on a range of networks. Those services can cost $30 or more a month, and don't allow you to reap one of the major benefits of not having cable: saving money. A month ago, ESPN extended sports fans an olive branch in the form of ESPN+. While the standalone service doesn't have it all, it's well worth the $5 monthly fee. First, let's chat a bit about what ESPN's WatchESPN streaming option offers cable subscribers. It's basically an all-access pass to live streams across ESPN's networks, including archived replays and events from ACC Network, SEC Network and a lot of streaming-only (ESPN3) live action. Like the new ESPN+, WatchESPN stuff is tucked into the main ESPN app for easy access, but there's really no overlap between the two services. With ESPN+, you basically get live and archived streams from a group of regional networks that ESPN has locked in deals with. Well, so long as the event isn't blacked out in your area. This time of year, that means a lot of baseball -- both MLB and NCAA (softball, too) -- with a side of soccer tossed in. For me, the best part about ESPN+ is the availability of MLS matches that used to be inaccessible without adding another pricey subscription. Before ESPN+, the options for streaming MLS matches were pretty much limited to whatever the match of the week was on ESPN or Fox -- unless you were willing to pay for an additional service. And to watch those, you needed a cable plan (or someone's log-in) to get them on WatchESPN or Fox Sports Go. Thankfully, I live close enough to Atlanta that a lot of Atlanta United's matches were picked up by Fox Sports South and thus streamable. Other than that though, I was lucky to be able to watch two, maybe three MLS games a week. And almost never any midweek games carried by local/regional stations. Over the last month though, I could've streamed every MLS match that wasn't televised on an ESPN or Fox network with ESPN+. This is partially due to the fact that the annual MLS streaming plan, MLS Live, is now wrapped into ESPN+. What soccer fans used to pay $80 a year now costs them just under $60 annually -- and there's access to a lot more than just footy. The old price was too much for this closet MLS fan, but the lower cost and the fact that there's more on the table besides soccer makes ESPN+ a much better deal. If you prefer European soccer, ESPN+ also offers access to England's second tier, the EFL Championship. That will come in handy in a few months if you follow the recently relegated West Brom, Stoke City or Swansea. ESPN+ isn't handy only for soccer fans, that's just how I'm using it most right now. There are regional MLB broadcasts as well as a whole host of college sports. It's probably also going to be useful during college football season, especially when your team is either a) playing a cupcake early in the season or 2) not in the upper echelon of the sport. The only real trade-off not having access to what you'd watch on ESPN's TV channels -- namely its studio shows. For me, that's not really a deal breaker since only one, maybe two, of those hour-plus chunks of "analysis" is worth my time. What can I say, I'm not a fan of Mike Golic or Stephen A. Smith. There some ESPN+ exclusives and there are sure to be more in the future. Right now though, the most interesting item on the list is a deep-dive NBA show hosted by Kobe Bryant. 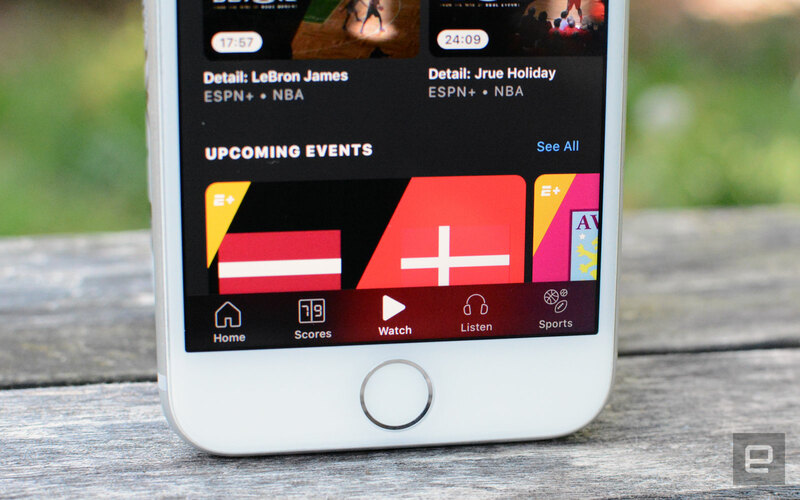 And while there's no live access to ESPN's flagship SportsCenter, the network recently announced a daily curated version of the show inside the ESPN app. They aren't exclusive to ESPN+, but the 30 for 30 documentaries are also available with the $5 monthly plan. ESPN has also done well to get its standalone option on as many platforms as possible from the jump. It's available on iOS and Android as well as Apple TV, Chromecast and Roku (and the web, if you must). And as I mentioned already, tucking it inside the main ESPN app was a great move. It wasn't too long ago you needed multiple pieces of software on your phone to keep up with news and live sports. 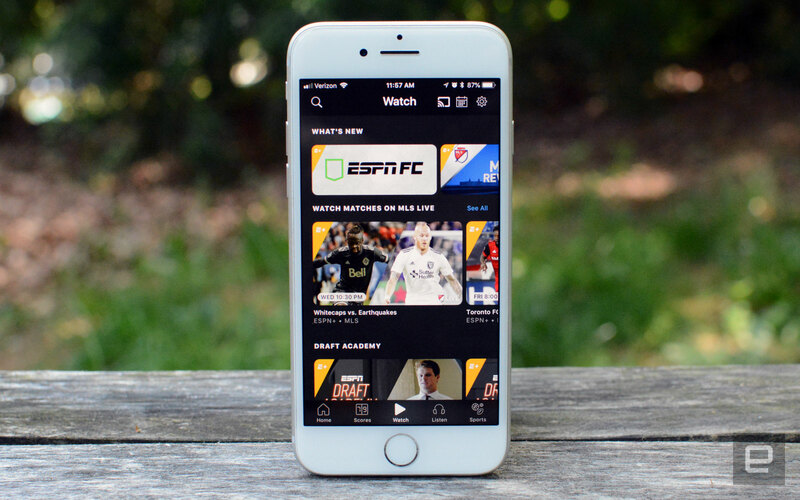 But like it did with WatchESPN in 2015, ESPN made ESPN+ easily accessible inside its main app. Unsurprisingly, given ESPN's experience with streaming, there haven't been any major hiccups in the first month. In fact, the only issues I've encountered were network problems, not anything to do with the app. If you have a cable plan and opt for ESPN+, access to WatchESPN is easy to find in the network's app under the same "Watch" tab. There are also handy ESPN+ previews so you can see exactly what's going on before you tap to stream. Or if you just want to take a quick peek at a score without wading in further, you can do that too. It's a small thing, but I've found quite handy when I'm just browsing. I'm less likely to casually flip on an MLB game that's already a blowout, and this helps with the decision-making. 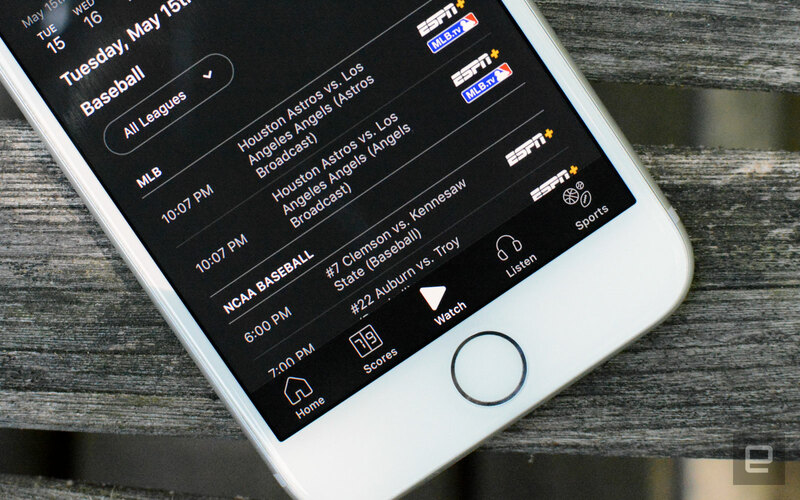 ESPN+ won't completely cure your live sports withdrawal if you've already cut the cord. However, that doesn't mean it isn't a great deal. In fact, you get a lot of live action for $5 a month. It will also be interesting to see how other broadcasters react to it. Fox, for example, has a group of regional networks it could wrap into a similar standalone service. NBC is already doing it for Premier League soccer games it doesn't show on its networks. Of course, that means you have to pay extra to watch any match that isn't broadcast on an NBC channel, which is infuriating. It also means paying more for what used to be included with a cable plan. For me, that just meant I watched a lot less Premier League this year and didn't get to see my club (Everton) play every week. NBC offers similar "Gold" subscriptions for Motocross, track and field, rugby and cycling. With Disney's big streaming push, the company could decide to offer a pricier ESPN option with access to that content you really want. But, that's still a big bargaining chip for cable providers, so I wouldn't hold my breath. What ESPN+ will do is give you a respectable amount of sports at a price that doesn't require careful planning. Disney was clear it's a complement to ESPN and WatchESPN rather than an alternative. But that doesn't mean there isn't value to it being your sole method of streaming live sports. For me, that means I'm watching a lot more MLS while the European leagues are off for the summer -- and it's worth every penny.